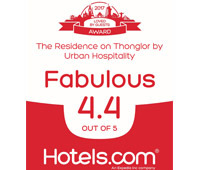 1.1 Please read these terms and conditions carefully before using the Residence on Thonglor website (“www.residencethonglor.com”) which is operated by 1hotelsolution.com Co., Ltd. By accessing or using the Website you agree to be legally bound by these terms and conditions as they may be modified and posted from time to time. 5.3 To the fullest extent permitted by applicable law, We accept no liability for any loss or damage of any nature whatsoever and howsoever arising out of or in connection with the viewing, use or performance of the Website or its contents whether due to inaccuracy, error, omission or any other cause and whether on the part of The Residence on Thonglor by Urban Hospitality or our servants, agents or any other person or entity. 8.1 You authorise us to use, store or otherwise process any personal information, including but not limited to your name and address, which personally identifies you (“Personal Information”) to enable us, our affiliates, our partners, successors (including the purchaser of the whole or part of our business), associates, sub-contractors or other third parties (together our “Partner Companies”) to provide services and products which are available through the Website.